It wouldn’t be Thanksgiving without a big old basket of cornbread, right? As much as I love cornbread, I definitely don’t make it enough. It debuts during the holiday season, only to resurface as blueberry cornmeal muffins over the summer. What’s left in between is a bottomless bag of yellow cornmeal and fruitless ideas. But since I have an incredible habit of re-doing, changing, fiddling around with recipes, I now present my buttermilk cornbread. 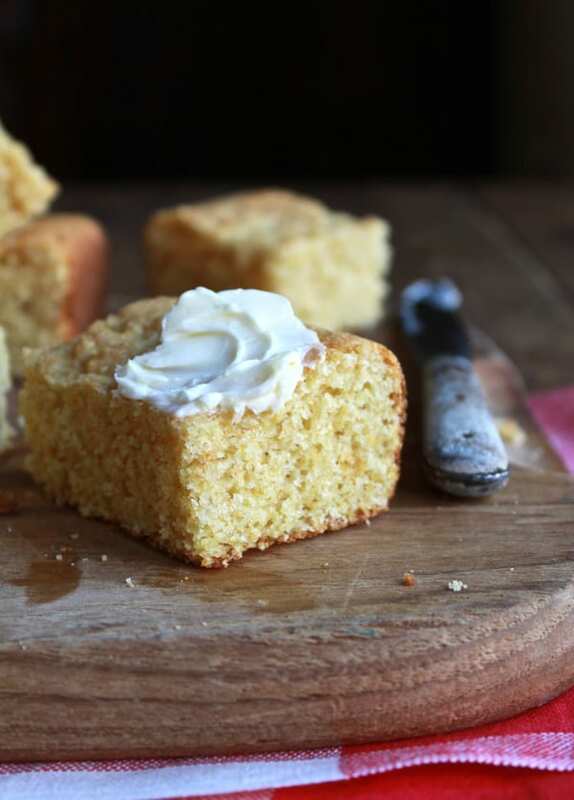 This cornbread is fairly crumbly in texture but sturdy enough to cut into thick slices. The corner pieces are crunchy around the edges and the center is soft. The addition of buttermilk keeps everything nice and moist too. I’m totally content with eating it plain, but who am I kidding? A good smear of warm butter over the top doesn’t hurt. Cornbread tastes best on the day that it is made. If want to make this ahead of time, simply measure out your wet and dry ingredients the night before (keep them separate) and bake it off in the morning. Make sure to use an 8×8 pan if you want thick slices whereas a traditional 9×13 pan will give you thinner ones. Serve warm from the oven or at room temperature. 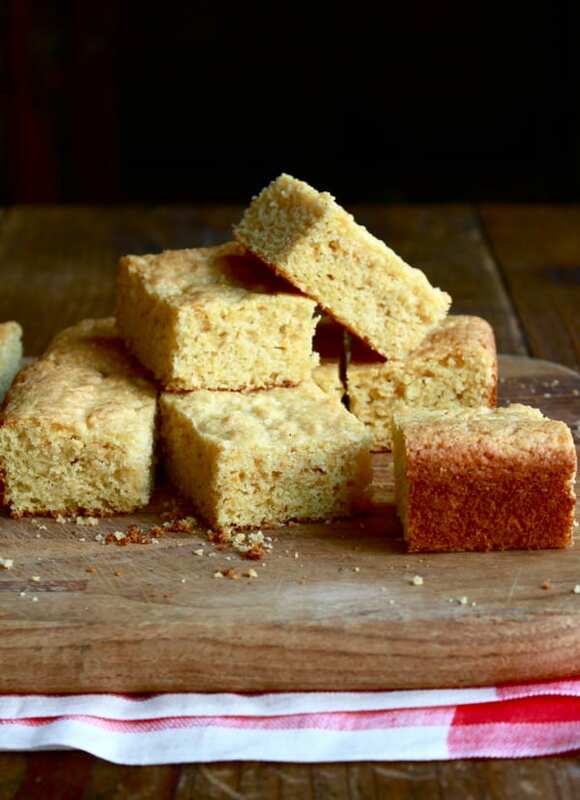 What’s your favorite cornbread recipe? Lightly grease an 8x8 pan with a little vegetable oil. Line the pan with parchment paper creating an overhang on each side. These will be your 'handles' to lift out the bread. Working over a large bowl, sift all of the dry ingredients together. In another bowl, whisk all of the wet ingredients making sure that everything is well incorporated. Pour the wet ingredients into the dry ingredients and mix with a wooden spoon until there is no visible flour. Do not over mix as this will create a dry, tough bread. Some lumps are ok.
Pour the batter into the prepared pan using a rubber spatula to scrape down the sides of the bowl. Bake on the center rack for about 15-20 minutes, or until a toothpick comes out clean when inserted. Remove from the oven and allow to cool in the pan for 20 minutes and then transfer to a wire rack. If you are using a glass baking pan, remove the bread after 10 minutes as it will continue to cook in the pan. Serve warm or at room temperature with a little butter on the side. *If you are using a baking pan larger than 8x8, you might need to decrease the cooking time depending on its size. 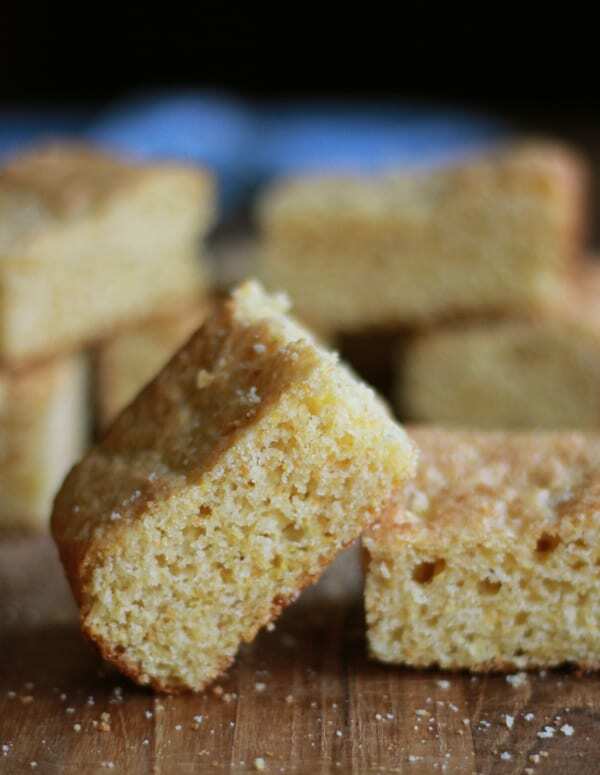 Cornbread is such a delicacy, and this looks terrific. I really like my grandmother’s recipe and I also love the Barefoot Contessa varieties. Thanks so much! I haven’t tried any of Ina’s cornbread recipes, but I bet they are great. All of her recipes look good, don’t they?